This is the short spined form of E. davisii. 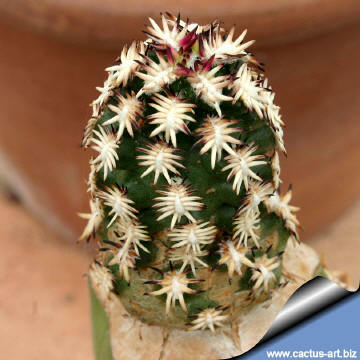 It is very beautiful and still rare in cultivation. Description: This is the rare and beautiful short spined form of E. davisii. 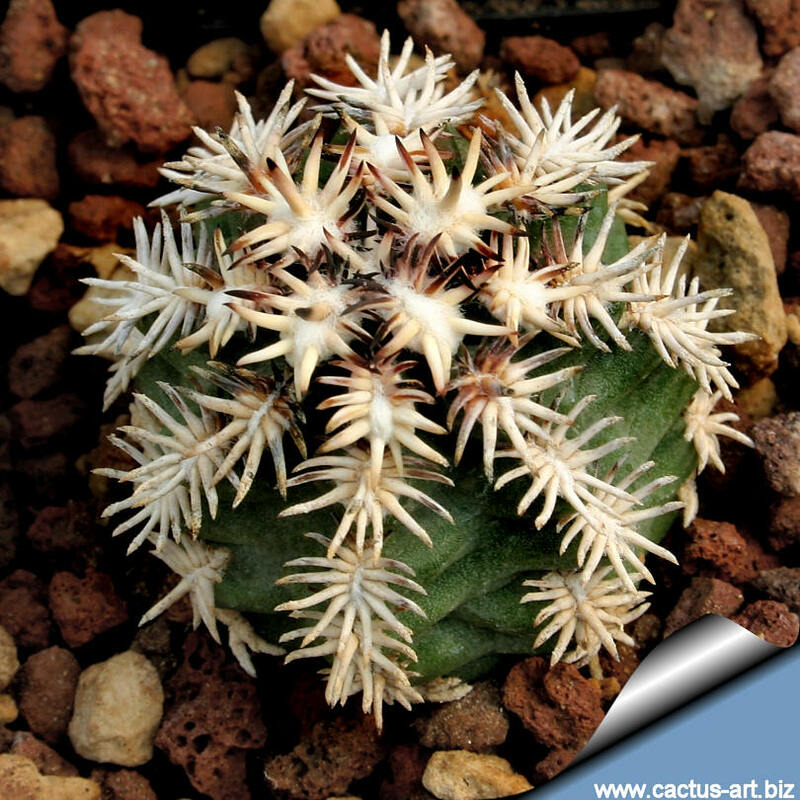 This plant has an unique and unmistakable appearance and is considered by many among the nicest cactus cultivars. The standard E. davisii is the tiniest Echinocereus species, plants are extremely diminutive and mostly subterranean (geophytes), usually do not offset. Stem: Spherical stems with 6-9 ribs, dark green epidermis up to 1-2 cm in high and 1-3 cm in diameter (but cultivated specimens can grow bigger). 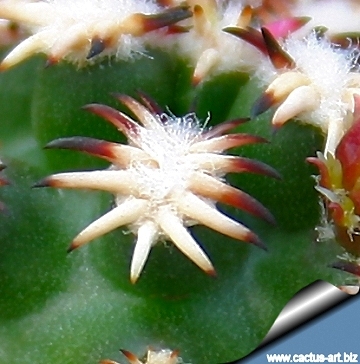 Spines: The areoles contain 8-14 spines, usually radial, pectinated, short but stout fang like, white whit a dark contrasting tip. 2-4 mm long. Roots: Fibrous in young plant became tuberous in age. Flower: Yellow-green whit a green stigma and yellow pollen, up to 2 cm across, (buds acute, reddish and yellow-greenish). Phenology: Blossoming and fruiting occur on 3 to 4 year-old plants. Blooming period in cultivation is March-April. A plant in flower form Robert Maijer collection. 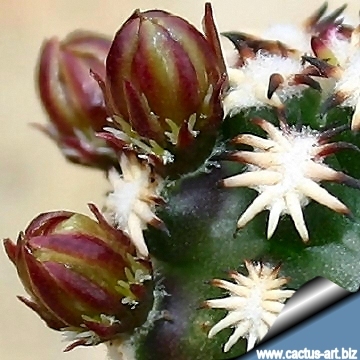 Buds show a basal crown of short yellowish spines. with a dark red or black tip. Habitat: Grows in flat hills on a specific substrate (rich in quartz sand) in a semi-desert grassland at an elevation of 1,200 m Sometimes plants in drought periods shrink well below ground level. In Hunt. 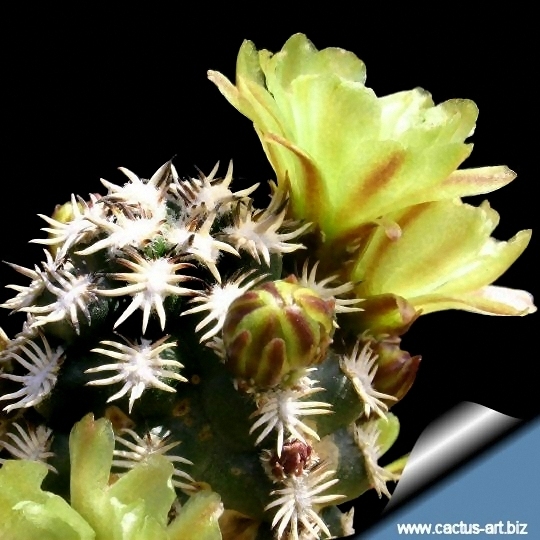 Cact.Cons. Init. 3: 10 (1997). The flowers are yellow-green . 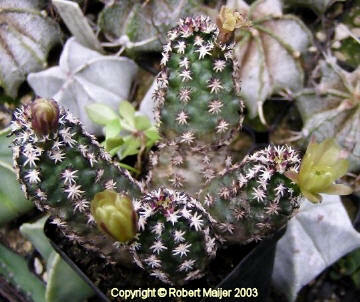 A small (2,5 cm) plant grafted on Opuntia compressa. This grafting technique greatly enhances the production of flowers! Cultivation: In culture E. davisii is without problems but very slow growing and regularly shows its small green flowers if we provide an adequate winter rest period. 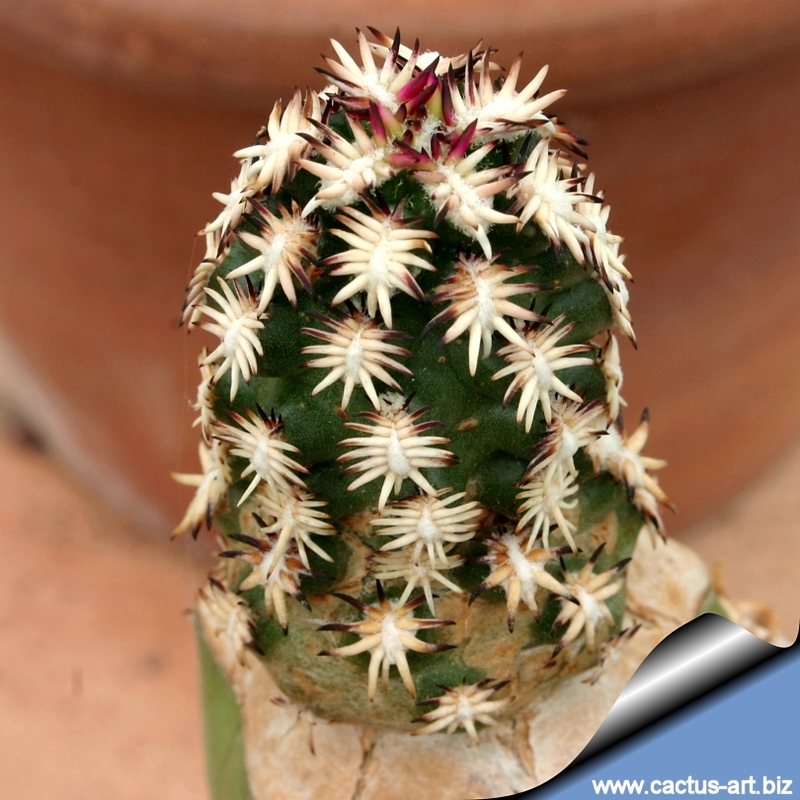 It is sensitive to overwatering (rot prone) needs good drainage, Keep drier and cool in winter. Need full sun; Very cold resistant hardy to -18° C or less for short periods of time. 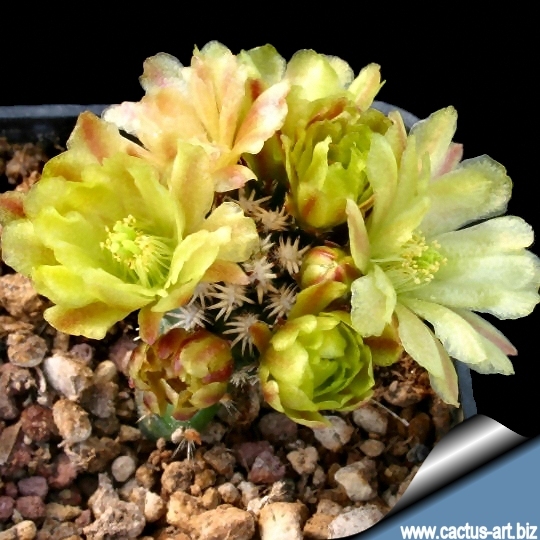 Photo of conspecific taxa, varieties, forms and cultivars of Echinopsis davisii.